We’re excited to share with you an “Editor’s Rough Cut.” This is a preview of an article slated for a future magazine issue which is being shown in an “under-construction” state. So, unlike a partial or full excerpt of a print article, what you see here may most certainly change, right down even the title of the piece or the spelling of the author’s name! Tell us what you think and we hope you enjoy. One of my favorite natural environments is the forested edge of a tropical stream. Walls of vegetation rise from the riparian zone in a tangled riot of biodiversity while choruses of birds, frogs, and insects sing their hearts out. In the stream itself, tropical fishes cavort and live out their little dramas. It’s in these places that I feel most inspired, and I can spend hours enchanted by the vibrant energy of tropical nature. In the winter of 2013 I was deep in the throes of designing my Seattle aquarium shop, Aquarium Zen, and wanted to pay homage to those tropical riparian forests that have inspired me in years past by setting up a unique store display. 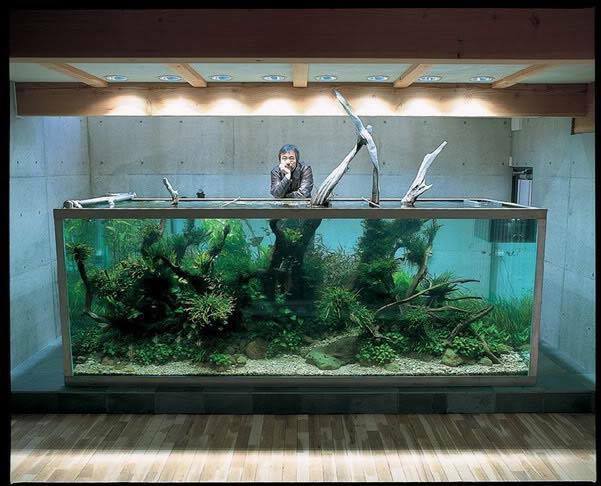 My goal was to create an aquarium that evoked the sensations I feel when standing near a jungle stream, and though I wasn’t yet sure what form my design would take, I knew I had to think outside the box to make it happen. Luckily, that year I had gone to San Diego to attend the Microcosm event, a gathering that brings all the glass box hobbies—aquariums, vivariums, orchids, tropical frogs, tarantulas, geckos—together under one roof for a few days. I hit it off with a talented living-exhibit designer, Zac Zamora of Variance Design. Zac had been building small-scale vertical garden systems (also known as “living wall” or “green wall” systems) that he was hoping to market at Microcosm, and I was really impressed by his designs. Simultaneously, I had been studying the work of the French vertical-garden artist Patrick Blanc, and I had a desire to create a vertical garden of my own. 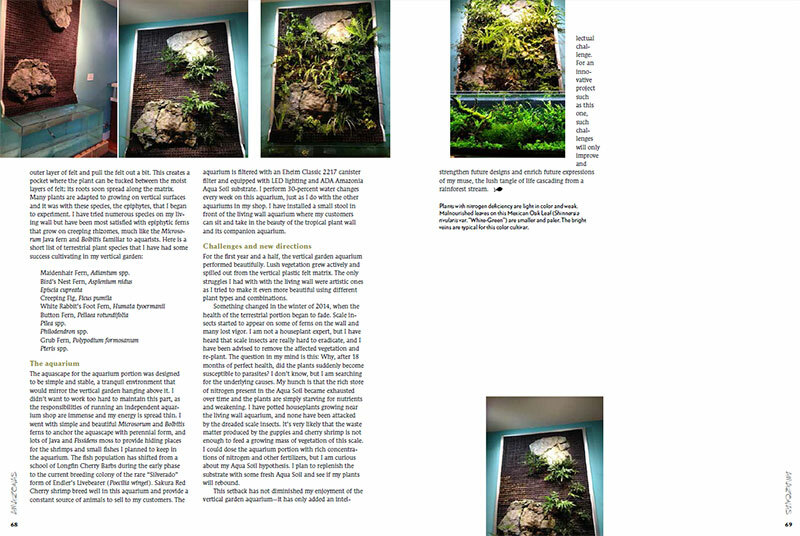 After Microcosm, Zac and I collaborated on a living wall design for Aquarium Zen. Zac is a master fabricator and can create anything his imagination dreams up; soon a pallet with my blank canvas—a vertical garden system—arrived from Zac’s workshop in Texas. All vertical garden systems require a loop of circulating water that is pumped from a reservoir up to the top of the wall and then cascades down the wall through irrigation tubing. Usually, the reservoir is hidden and is not really a focus of the design, but rather just a utilitarian sump filled with water and nutrient solutions. 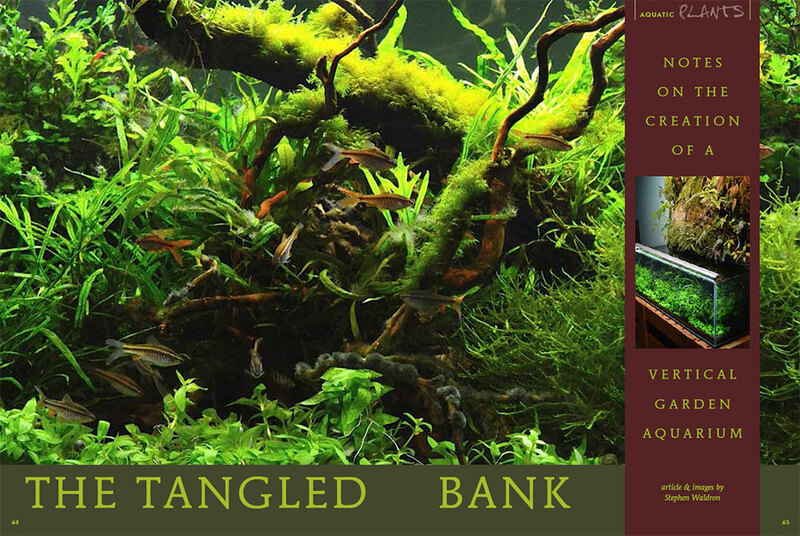 By designing a living wall that would utilize an attractive aquarium as its reservoir, Zac and I were heading into some fantastic creative territory and getting closer to my ideal of recreating the vibe of a tangle of vegetation growing along a rainforest stream. Like what you’ve read so far? Curious to know Steve’s secrets and techniques used to create this focal piece? Want to see how this article turns out? Don’t delay; make sure your AMAZONAS magazine subscription is up-to-date today! This article is currently slated to appear in the May/June 2015 issue of AMAZONAS Magazine (subject to change). An “Editor’s Rough Cut” is a work in progress. This is the current state of the end of Waldron’s new article. "It is interesting to contemplate a tangled bank, clothed with many plants of many kinds, with birds singing on the bushes, with various insects flitting about, and with worms crawling through the damp earth, and to reflect that these elaborately constructed forms, so different from each other, and dependent upon each other in so complex a manner, have all been produced by laws acting around us. These laws, taken in the largest sense, being Growth with reproduction; Inheritance which is almost implied by reproduction; Variability from the indirect and direct action of the conditions of life, and from use and disuse; a Ratio of Increase so high as to lead to a Struggle for Life, and as a consequence to Natural Selection, entailing Divergence of Character and the Extinction of less improved forms. Thus, from the war of nature, from famine and death, the most exalted object which we are capable of conceiving, namely, the production of the higher animals, directly follows. There is grandeur in this view of life, with its several powers, having been originally breathed by the Creator into a few forms or into one; and that, whilst this planet has gone circling on according to the fixed law of gravity, from so simple a beginning endless forms most beautiful and most wonderful have been, and are being evolved."